Drastic reductions in home values have driven many homeowners’ equity to negative levels, and returning to break-even will, for most, require several years. Consequently, a significant portion of these upside-down homeowners will walk away from their houses, even if they have the financial means to continue making payments. These strategic defaults have mixed implications for the broader economy. While skipping home payments may boost consumer spending, the ensuing increase in foreclosures could send new shockwaves through the economy. Increased foreclosures may drive additional price declines, in turn enticing more homeowners into strategic defaults. This negative ripple would spur rising consumer caution and exacerbate weakness, further delaying the onset of a self-sustaining growth cycle. An estimated 6.2 million homeowners owe more on their home than its worth, and assuming values do not decline further, approximately 90 percent will need at least five years to return to break even. 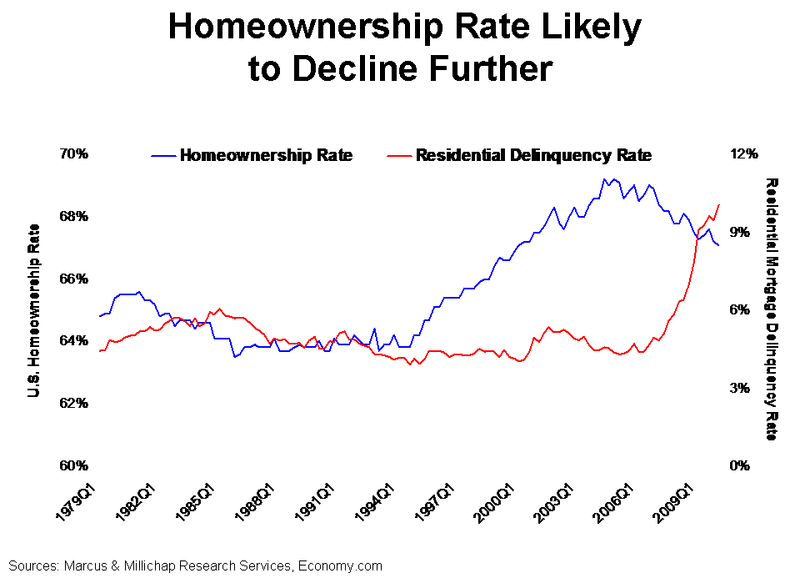 Currently, the U.S. homeownership rate rests at 67.2 percent, 180 basis points below its recent peak; however, the effective homeownership rate, which excludes upside-down homeowners, comes in 5.6 percentage points lower. This homeownership rate gap ranges dramatically by metro area, hitting almost 20 percentage points in markets like Phoenix and Miami and topping out near 40 percentage points in Las Vegas. A share of mortgage default-related cash has likely been used to pay down other types of debt, contributing to a nearly 3 percent decline in outstanding consumer debt through the recession. In addition, cash originally earmarked for mortgage payments may have been spent elsewhere in the economy. During the first quarter alone, residential mortgage defaults freed up a significant $14.9 billion, but the likely impact on consumer spending remains limited. Even if the entire sum were spent by consumers, it would contribute just 1.4 percent to total retail sales. Apartment owners will benefit from residential defaults as some of the 6.2 million underwater homeowners become renters. Vacancy improvements will likely be concentrated in late 2010 and 2011, when the economic recovery gains additional traction but before multifamily development builds momentum. Many bank-owned homes will be purchased by investors and employed as rentals, however, elevating competition from shadow rentals and limiting upward pressure on rents for the next 12 to 24 months. By late 2012 or 2013, though, the expanded renter pool, which also will benefit from the echo boomer population surge, should contribute to accelerated rent growth, likely pushing the pace above trend. As a portion of the cash held back from mortgage payments is spent, retail sales will receive a boost. Increased foreclosures, however, will place additional strains on home prices and negatively impact household balance sheets. For each dollar of wealth lost in home values, consumption declines by an estimated 5.5 cents. These competing forces, along with expectations for relatively modest job growth through the early stages of the recovery, will cause retail fundamentals to lag the broader commercial market. Metro areas that experienced the most severe home price reductions now register the most significant homeownership rate gaps and will be subject to the longest delays in a retail market recovery. This entry was written by marcusmillichap, posted on June 11, 2010 at 9:23 pm, filed under Research and tagged Housing. Bookmark the permalink. Follow any comments here with the RSS feed for this post. Trackbacks are closed, but you can post a comment. blog.marcusmillichap.com’s done it again! Great post! Strategic defaults will continue to rise. If it takes more than 5 years to recover the equity that was depleted, it makes perfect sense. The money saved has to be invested wisely. If you are saving $3,000 a month in mortgage payments, and it take the bank 8 months to get you out of the house, you should have $24,000 to play with. I’m a Realtor and have found that the most prolific culprits of strategic foreclosures are Realtors and the clients they advise. They have the moral hazard justified by the montra “this is my part of the bailouts.” I personally find this activity unethical but it is the only way people are able to substitute for the banks unwillingness to do a loan modification. A Realtor like myself can only advise people financially. The banks give to much on the approval for a mortgage but buyers have to be aware and back off of that number considerably to be “safe”. People have to take into account job loss,sickness/disability,babies born and many other factors that can change the financial structure of homeowners. Banks need to give more principle reduction where is needed if the homeowner can afford their home and If they can’t afford them they need to sell it.